Before embracing a relationship, have you asked yourself what your relationship will look like, and what attributes you want to have? Let’s take a deeper look at some vital aspects of romantic relationships. It is important to learn from all of your accumulative experiences, and be prepared to have ‘practice’ dates and relationships. If for no other reason, it is to show you more of what you do not want and then you can re-define what you do want. It is important to recognize and appreciate the contrast. 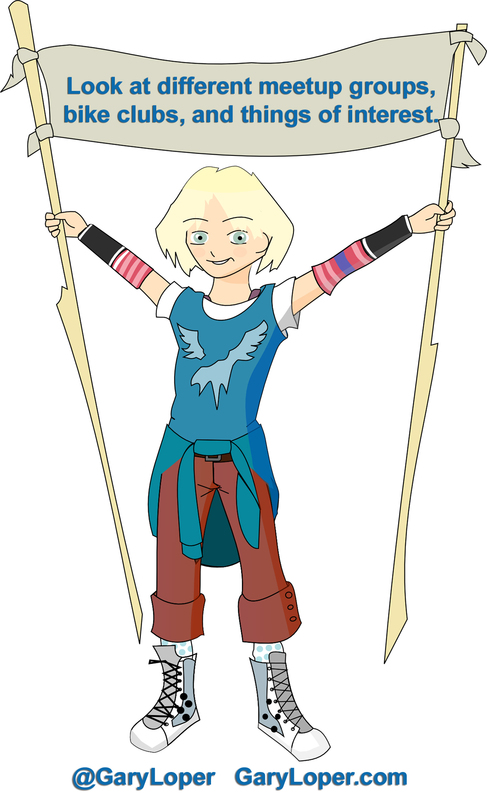 There is no such verbiage as ‘waste’ in my vocabulary. If you express that you wasted 7 years in a marriage, change your thoughts and look for appreciation and gratitude for the experience. With each experience brings knowledge and growth. Remember the other person was there to help you heal. People come into our lives at the time when we need the lesson. First create a list of attributes. List those aspects you found appealing about the other person. 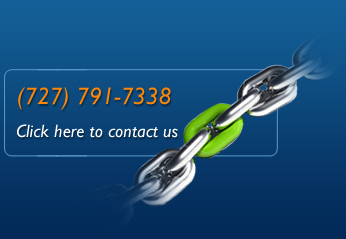 You will be amazed at the list, and how it will expand naturally. Even if qualities overlap, you will learn what resonates with you. My list had no physical qualities. I was not locked into hair color, eye color, etc., just being healthy, for example: being conscious about exercise, walking, and yoga. It is the Law of Attraction. So, if you get too focused, too narrow, you are telling the Universe that those are the only things you will accept. You are not allowing the Universe to bring you any variance of something that could be even better. Even the lottery, or saying you want to win a MILLION dollars …. What if the Universe wants to bring you more? You are limiting yourself. Next, look at people you want to model a relationship after. Find other people that have successful relationships. Start acting as they act. Then hang out with them. When upgrading your friends, your circle of influence, the sum total of the five people you hang around the most, you will learn that they are your strongest influence. You may have to upgrade your friends to people who are in better alignment with what and where you want to be. Look at different meetup groups, bike clubs, and things of interest. Do things that you love to do, and find people who love the same things, with a similar common interest. What is the most important thing to you? If you love to run, then join a group that runs on a regular basis. If your religion or spiritual practice is crucial to you, start practicing your faith and go to your place of faith. Start shopping for those places of interest. Most importantly, before you start a relationship, love yourself. If you want to be loved, be more lovable. You have to become what you want. Be loving. Add value. Put the needs of others first. Also, give away first the things you need to receive. Moving from that dating phase into the long term commitment is vital to recognize what is next. Your relationship will grow into a different feeling of love. When you first meet there is that hypnotic feeling of lust and passion, as you feel in the first few years. It is called P.E.A. It is often called the ‘Love Drug’. When you realize this, you begin to realize the nature of relationships. You will know that at the beginning part of the relationship you are going to have the P.E.A. hormone spike, and over time it will change. This will help you to be mindful on how to truly love one another. Knowledge is so powerful. This is where Reflective Listening is important, one of the most valuable tools to creating the best possible relationship. Knowing that the P.E.A. will wear off, it makes it even more important to be aware of Reflective Listening, our individual Love Languages and focusing on making the other person happy. Make the promise, that vow to make the other person happy, and speak their Love Language. Remember you cannot put your love on the shelf like some people do. They wait until after the kids grow up, or after their career. You must work at it every day! 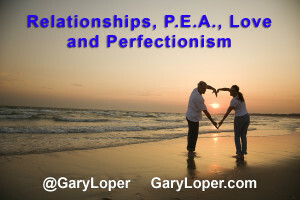 Are you striving for the perfect relationship? There is no such thing as perfection. We can continue to pursue excellence and improvement. Perfect is always changing. Otherwise, you are locked into that one vision instead of being open to the constant pursuit of improvement and excellence. Going back to the P.E.A., when we are under that trance we do not see the dirty dishes, the clothes on the floor, the pee on the toilet rim, you don’t see it! You are under the influence of the P.E.A. When it wears off, it didn’t change. You just didn’t notice all those things because of the P.E.A. That is why it is essential to build a strong foundation in your relationship from the start. 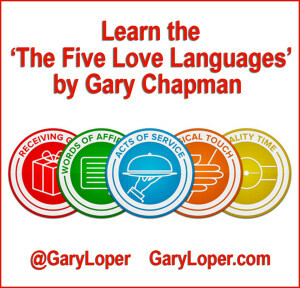 Discover Your Love Language, take Gary Chapman’s free test. Looking to have a deeper understanding of relationships, download my free eBook, 20 Secrets to Building Better Love Relationships. What would you do with 20 hours?